The knife used by Christopher Robson in the attack. A pizza delivery worker says he gets 'daily flashbacks' of being subjected to an horrific attack by a 'laughing' knifeman. 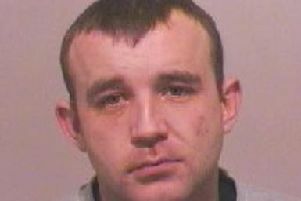 Christopher Robson was jailed for life - and told he cannot be considered for parole until he has served at least seven years - for the brutal stabbing of Darren Aspley as he was delivering takeaways. Newcastle Crown Court heard Mr Aspley suffered knife wounds to his face and neck and feared he was going to die as Robson laughed and told him: "I'm going to ******* kill you." Mr Aspley spent four days in an induced coma during a ten-day hospital stay and survived only due to medical intervention. Robson, of Manor Road, Concord, Washington, who has as history of mental health problems, admitted attempted murder and also pleaded guilty to possession of amphetamine and carrying two knives in the street, which he confessed he did "all the time", just two weeks before the stabbing. In a victim statement, Mr Aspley said: "I can’t hide the scars to my face, and this doesn’t make me feel very good. "People always ask me what happened and look at me. I’ve slept terribly ever since, I get daily flashbacks – the stabbing has changed me." Speaking after the case, Detective Constable David Holcroft, of Northumbria Police, said: "This was a horrific and unprovoked assault which could quite easily have been a murder without the excellent work from medical staff and the quick actions of the victim’s friend. "Christopher Robson is a dangerous individual who has shown no remorse whatsoever for his actions, and only pleaded guilty to his crimes at the last opportunity due to the gravity of the offence and the overwhelming evidence against him. "The streets of Washington are much safer with Robson behind bars. "The victim has suffered serious physical repercussions as a result of this brutal assault, and will have to bear the scars for the rest of his life. "This frightening incident has affected Mr Aspley not just physically, but also psychologically. It has been a traumatising year for the victim, who left his job as a result of the assault. "I would like to commend Mr Aspley for his bravery and cooperation throughout this investigation, and I sincerely hope this sentence can bring some kind of closure which can allow him to rebuild his life again. "I hope this sentence serves as a reminder that we are committed to dealing with violent criminals robustly and hold them accountable for their actions."